We build immersive learning workshops that enable individual, group and organizational change. We create customized, immersive development events that are transformative. Our workshops are built on case studies that highlight leadership competencies and address specific management challenges. We facilitate collaborative discussions among participants. Our workshops enable learning by provoking discussions that surface leadership and management issues and provide a forum where managers can learn from one another. We produce events that get results. Our workshops don’t simply inform, they lead to real and measurable change. Learning for learning sake is not enough. Participants are able to quickly apply what they’ve experienced to address immediate issues. A portion of the proceeds from each workshop goes toward the non-profit affiliated with the experiential component of each program. Our mission includes not only creating great experiential learning workshops but also helping to grow philanthropy, raise awareness and build connections between the non-profit and the larger community. Our workshops enable organizations to realize development goals while building deeper connections with their neighbors. Most of us learn about key business principles by reading a textbook or sitting in a classroom. It is an entirely different experience to stand on a battlefield and live the leadership lessons of history where they occurred, Our operations team was captivated not only by the incredible sights they saw and stories they heard, but also by the many parallels between the critical decisions that were made at the Battle of Franklin and those that we make in our business each day. We believe that workshops like these can serve as a powerful management education tool that provides today's business leaders with leadership development experience that results in positive change. Tim and his entire team worked closely with us to; understand our needs and the key themes of our team-building event, ensure that those themes were woven into the historians stories and adapted the format to work for our very large group of over 200 participants. The theory of Experiential Learning has been around for a long time. From Confucius to John Dewey, Kurt Hahn and David Kolb, education theorists have recognized the value of learning by doing for some time. 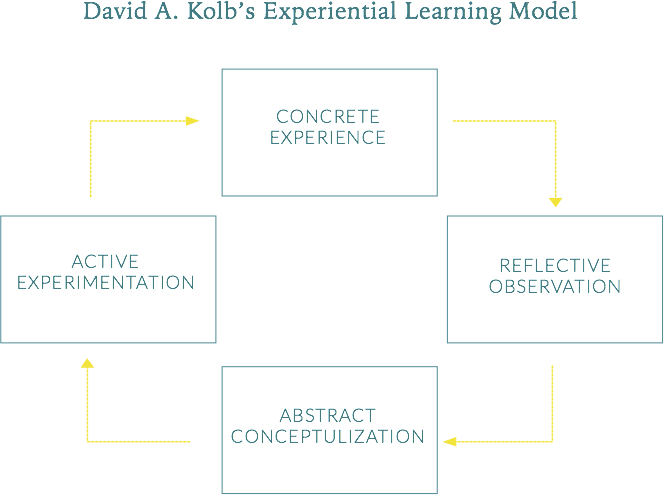 In the above representation of David A. Kolb’s experiential learning model it is suggested that learning happens when participants have a shared CONCRETE EXPERIENCE, allow them to REFLECT on what they’ve OBSERVED, provide a forum to CONCEPTUALIZE what they’ve learned and give them a chance to actively EXPERIMENT with this new TRUTH. Tim Pierce, founder and principle of experiential learning partners began his working life as a professional actor in New York City. It was in the theatre that he first discovered the power of the immersive experience. Years later, as Director of the Executive Development Institute at Vanderbilt’s Owen Graduate School of Management, Tim recognized during his 10 year tenure that most of the successful, results-oriented educational workshops that culminated in behavioral change included both intellectual and experiential learning. Whether through role playing, computer simulation, game theory exercises or small group discussion, the most successful development events included live, immersive and immediate activities directly tied to learning. It was the experiential learning that propelled workshop participants into self-reflection, and compelled them to crave a deeper understanding of the subject matter. Tim has always believed in the power of experience to transform individual human behavior. He is convinced that there are myriad opportunities to create effective, impactful and truly transformational educational programming that engages learners and leverages local, experiential learning. Let us help you build a customized experiential learning event that resonates with your organization and leverages local history (people, places and events) close to you.